It happened over two decades ago, but the humiliation of the defeat still haunts me to this day. I was an underwater medic trainee at the Naval Diving Unit (NDU) in Sambawang Camp. NDU was celebrating its anniversary with a sort of mini games day. One of the games was an eating contest. Because I looked like someone who could eat a lot, I was roped in to be part of the three-man team representing the medical centre. When the contest began, the first food I attacked was the slices of watermelon. Now I need to describe these watermelon slices carefully because they changed my life. The hard inedible green skin of the fruit had been cut away, but some of the white part between the green skin and the edible red fleshy part remained. As far as I knew, to win the contest, the rule was all the food had to be eaten. So naturally, I started eating the whole watermelon slice – the white part included. The trouble was everyone else was eating only the red part and throwing away the leftover white part. I thought this was cheating because most of the strewn white parts still had some red parts attached. This of course meant that everyone else was polishing off the watermelon much faster than I was and moving on to the other food. So I stopped eating the white part, but it was too late. My team came in last – all because of me. I had let the medical centre down. 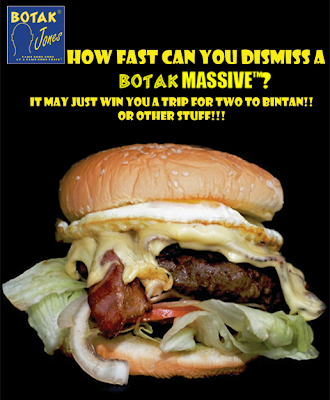 So when I heard about the Botak Massive Burger Eating Contest – finally, a chance to redeem myself? Organised by Botak Jones, this contest aims to find the masochist who can eat the Massive Sunrise Burger – a 220g beef patty, cheese, bacon, two fried eggs and a heart attack stuffed between two sesame seed buns – in the shortest time possible. The record so far is 1 minute and 12 seconds. The final round will be held this Wednesday evening at Botak Jones' Toa Payoh outlet. But because of my 22-year-old shame, I chickened out of joining the challenge. Instead, last week, I asked a colleague to time me eating the massive burger. This colleague, by the way, has already made it to the final round with a time of 4 minutes and 6 seconds. I figured if I could beat his time, all the watermelon nightmares would go away. My massive burger-eating time? 6 minutes and 27 seconds. Not even close. So in addition to bad dreams about fruit, my nightmares now also come with an entrée plus a side of coleslaw and spicy fries. No wonder I wake up every morning with such horrific flatulence.